The Corps Network and its members are a positive influence in the lives of young people and make a significant impact on the communities and natural spaces in which they operate.Through engaging young people in service projects that address important environmental and community issues, Corps tackle some of America’s greatest challenges. Response: Corps provide cost-effective service on public lands. Many programs train Corpsmembers to construct and maintain trails, build bridges, restore stonework, identify and remove invasive species, and control erosion. Corps train the next, more diverse conservation workforce. Response: Corps provide young people with the skills, experience and credentials to succeed in the job market. Through service to their communities, Corpsmembers build important workplace “soft skills” and develop leadership abilities and self-confidence. 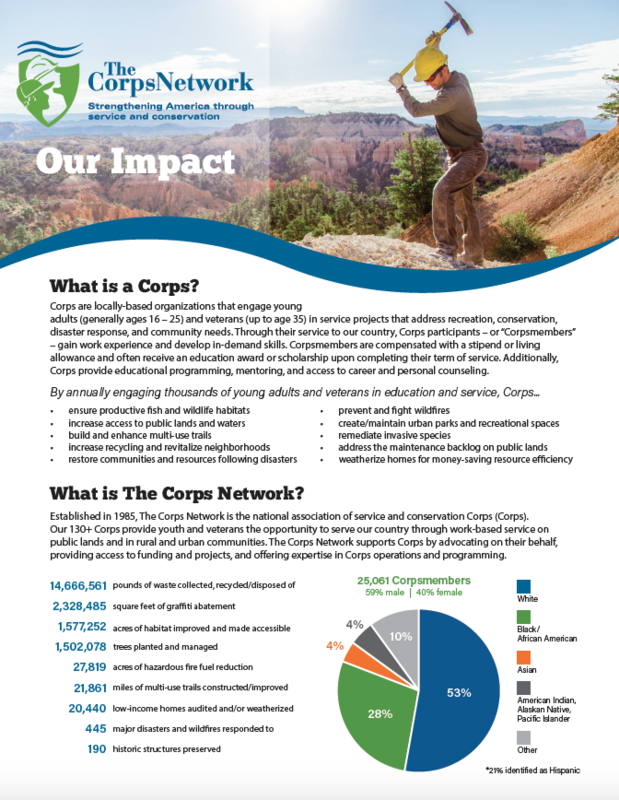 Many Corps help Corpsmembers receive professional certifications that help them obtain jobs in the expanding green industry. Response: Through charter schools and partnerships with local colleges and other educational institutions, Corps help young people earn their GED, high school diploma, and/or postsecondary degree. 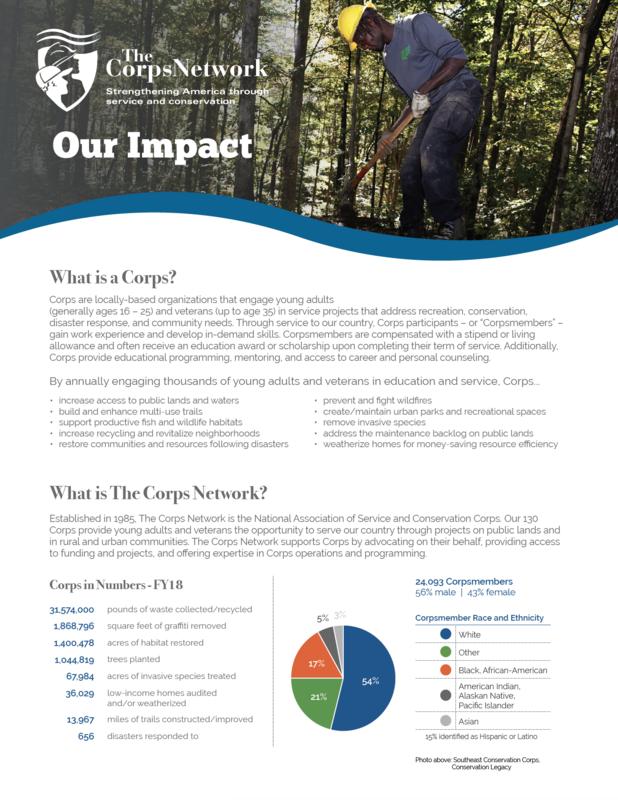 Corps can provide more one-on-one attention in the classroom than a traditional high school and offer comprehensive academic, career and personal counseling. Students receive ongoing support to help them transition to, and persist in, postsecondary education and training. Response: Some Corps operate recycling facilities and educate the public about proper waste disposal. Some Corps train Corpsmembers in disaster response and travel throughout the country to help communities recover after storms and floods. Some Corps train Corpsmembers in wildland firefighting and help prevent or mitigate dangerous blazes. Some Corps train their Corpsmembers to install energy-saving retrofits in businesses and low-income homes. Corps help communities prepare for, and react to, the realities of our time.